The ancient and medieval rock city of Perperikon features remains from all time periods since the Neolithic Era. Photo by Nenko Lazarov from Wikipedia licensed under CC BY 2.5 via Wikimedia Commons. A total of 17 previously unseen archaeological finds discovered over the past year in the Ancient Thracian and Roman rock city and medieval fortress of Perperikon in Southern Bulgaria will be presented during the 8th Annual Exhibition “Bulgarian Archaeology" 2014. The new items from the stunning megalithic city of Perperikon in the Eastern Rhodope Mountains to be included in Bulgaria’s top archaeology exhibit have been revealed by Daniela Kodzhamanova, Director of the Regional Museum of History in the southern Bulgarian city of Kardzhali, as quoted by Darik Radio. 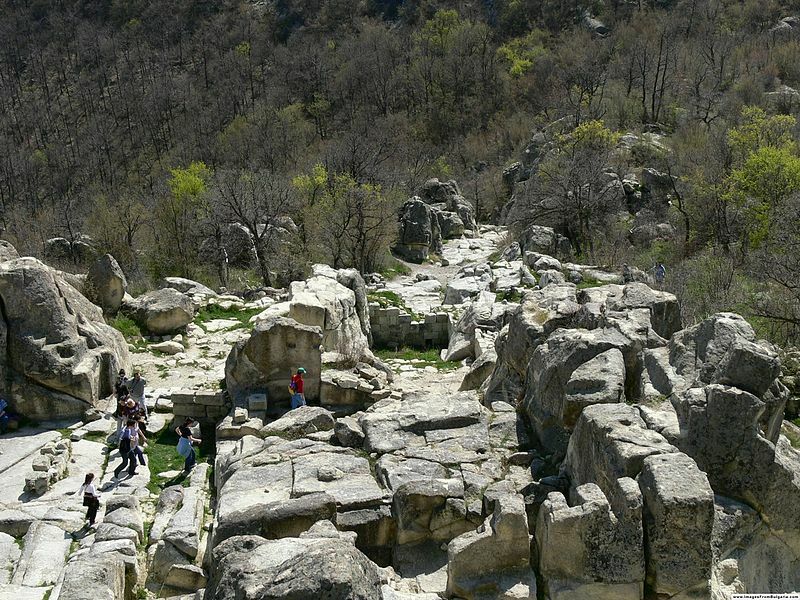 The ancient and medieval rock city of Perperikon is located in the Kardzhali District, some 15 km away from the city. The 8th annual exhibit “Bulgarian Archaeology" 2014 is taking place at the National Institute and Museum of Archaeology in Sofia between February 16 and March 29, 2015. The Perperikon artifacts never shown before, which will be on display in Sofia, include a bronze chisel dating back to the end of the 2nd millennium BC, 3rd-4th century ornaments, a silver earring from the 13th century, a bronze bracelet, and a fragment from a pottery vessel with an inscription made during its baking saying, “God, protect your slave Veronika". Kodzhamanova has also pointed out that the visitors of the national exhibit will also be able to see 14th century silver coins minted by rulers from the Second Bulgarian Empire (1185-1396 AD), including the best preserved coin featuring Bulgarian Tsar Ivan Alexander (r. 1331-1371 AD) with his son Mihail, and two silver Venetian coins, which are also brand new finds from Perperikon. In her words, after the end of the Bulgarian Archaeology 2014 exhbit, all of the new artifacts discovered in Perperikon will be put on display in the Regional Museum of History in Kardzhali, which is turning 50 in 2015. An information billboard at the ancient and medieval rock city of Perperikon. Photo by Nenko Lazarov from Wikipedia licensed under CC BY 2.5 via Wikimedia Commons. Tsar Ivan Alexander (r. 1331-1371) was one of the most notable but also most controversial rulers of the Second Bulgarian Empire (1185-1396). He had one of the longest reigns in Bulgaria’s medieval history which is known as a Second Golden Age for medieval Bulgarian culture, literature, and education (the First Golden Age being during the reign of Tsar Simeon I the Great – 893-927 AD). A prominent example of the achievements of the Second Golden Age is the so called London Gospel Book – an illuminated manuscript Gospel Book written and illustrated for Tsar Ivan Alexander in 1355-1356 which is kept today in the British Library in London. Politically and militarily, however, Tsar Ivan Alexander’s reign eventually proved to be disastrous for Bulgaria after he lost major Bulgarian-populated territories to Serbia and the Byzantine Empire, which at the time was using Ottoman Turkish mercenaries who later became invaders in their own right. Tsar Ivan Alexander lost his two eldest sons – Ivan in 1349 AD and Mihail in 1355 AD – in battles with the Ottoman Turks. What is more, he failed to prevent a number of Bulgarian feudal lords from seceding, and on top of that divided the remainder of the Bulgarian Tsardom between his two surviving sons. His third son Ivan Sratsimir (r. 1371-1396) received the smaller so called Vidin Tsardom, with the Danube city of Vidin as its capital, and his fourth son Ivan Shishman (r. 1371-1395) received the rest, the so called Tarnovo Tsardom, with the capital proper of Tarnovgrad (today’s Veliko Tarnovo). Just two decades later all Bulgarian lands, disunited and even warring among themselves, fell prey to the invading Ottoman Turks, ushering Bulgaria into five centuries of Ottoman yoke and signifying a practically irreversible loss of its former great power status.